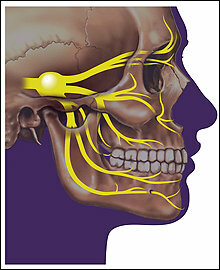 I have read some pretty detailed explanations of the trigeminal nerve and they only served to confuse me even more. I am going to try to explain it in a way that is far easier to understand. The control of the blood flow to the anterior (front) of the brain. Take a good look at this list…how many of you have complaints of ear problems? Tooth aches? Sinus problems? Migraines? Jaw Pain? How many of you have been to multiple doctors and have been told that there was “nothing” wrong? The trigeminal nerve root where these three branches meet, can be found next to the temporomandibular joint (TMJ) and some of the nerves pass around or through the TMJ. Damage or irritation to these nerves as well as muscle trigger points can cause a host of painful conditions. We have heard from some of our members that changes in hormone levels, along with stress and sleep deprivation, weather changes, and alcohol will sometimes trigger the trigeminal nerves to start firing off.